Three members of the Owen family - Chandler, Emily, and Joshua - take a homeschool 'field trip' to Sunnyside Beach, Wash.
Patricia Murphy reports on military families who homeschool their kids. Even in the middle of the school day, you won't find Rebecca and Tim Owen's children in a classroom. 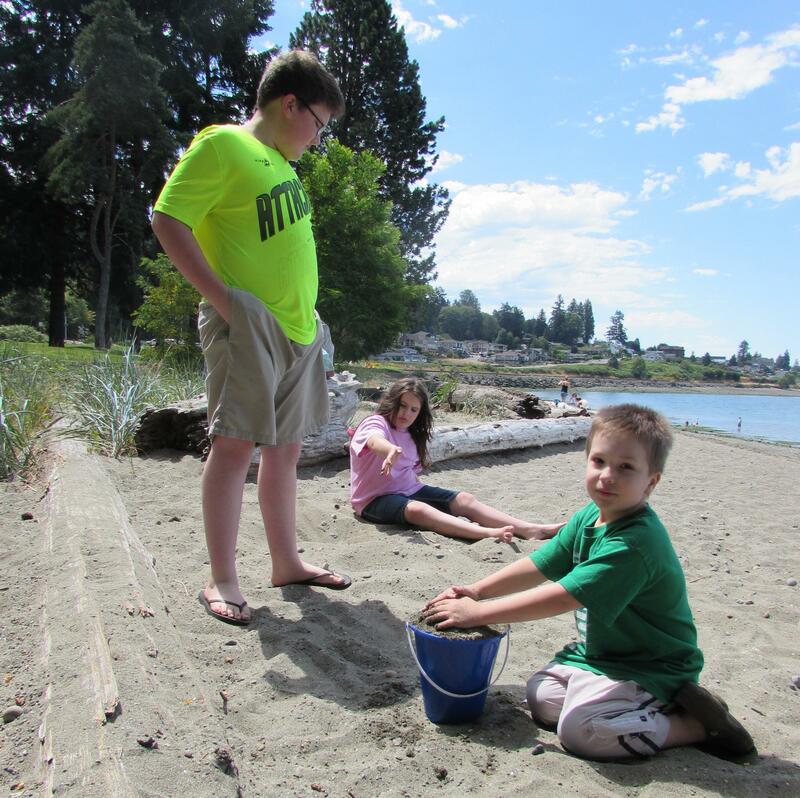 Instead, on a recent afternoon, six of the seven Owen kids were at Sunnyside Beach in Washington State. 4-year-old Zoe and 6-year-old year Joshua were looking for feathers to make a dreamcatcher, while the others read or explored the beach. The Owens are being homeschooled, and the trip was part of their curriculum. After Tim joined the Army in 2005, Rebecca Owen says it made sense to homeschool their children because the family moved around so much. "Our first duty station was Germany," she said. "But even before we got there, he had basic training and then we had other training, so we just kept homeschooling through all of this because it gave us the flexibility we needed." A decade after their stint in Germany, the six school age children are still learning at home in Dupont, Washington – near where their Dad is stationed at Joint Base Lewis-McChord. 18-year-old Deborah says it's been a great experience for her. She's planning to study graphic design in Idaho this fall. "Instead of being caught up with all the tests and all the grades and stuff that stresses out all of my peers, I've been able to focus on what I care about and want to pursue," she said. The Owens are among what seems to be a growing trend. Homeschooling is becoming more popular among the population as a whole. And while the Department of Defense doesn’t track the number of homeschoolers, a study conducted for the Army suggested military families are more likely to homeschool than civilian families are. Like homeschoolers in general, some military parents want to give their children a religious education or pursue their own curriculum. But Tom Halverson of the University of Washington College of Education says the nomadic life of military families is one of the biggest reasons they homeschool. Military kids move an average of nine times before age 17. "That can be a very challenging and chaotic situation for kids - completely jumping into new situations, new classrooms, new students, new teachers, new surroundings," Halverson said. "So a homeschooling situation, where students could have that consistency, I think could be a real advantage." But Halverson says homeschooling isn’t for everyone. He says parents of older children sometimes find it difficult to teach advanced subjects. "Especially for older kids, I think that's where you would start to run into a real challenge for parents being able to devote enough time to stay ahead of the kids," Halverson said. That’s a lesson Jen Stahl learned when she was homeschooled in the 1990's, as her family traveled the world with her Navy dad. She now lives with her husband and two kids in Germany and belongs to a group that advocates for tougher homeschool oversight. She said her homeschooling didn't prepare her well for college or a career, and she recalled the strong military influence of her homeschool education. "It was boot camp basically at home," Stahl said. "I actually would joke with people and say the only reason I didn't enlist is because I’ve already done bootcamp." Even Rebecca Owen – an enthusiastic homeschooler - ended up putting one of her daughters in a school run by the U.S. Department of Defense in Germany. It happened when her then six-year-old was having trouble reading. "It wasn't clicking for her," Owen recalled. "She was very stubborn and she thought only Dad could teach her how to read. Then Dad was being deployed." The Owens discovered that she had visual tracking issues and decided to send her to school each day for reading instruction. Like the rest of the Owen children, though, she eventually went back to full-time homeschooling. The Department of Defense says it neither encourages nor discourages homeschooling among military families. The federal government has no data to compare the academic achievement of military homeschooled children to other military kids.